In the four years that the Khmer Rouge ruled Cambodia, it was responsible for one of the worst mass killings of the 20th Century. The brutal regime, in power from 1975-1979, claimed the lives of up to two million people. Under the Marxist leader Pol Pot, the Khmer Rouge tried to take Cambodia back to the Middle Ages, forcing millions of people from the cities to work on communal farms in the countryside. But this dramatic attempt at social engineering had a terrible cost. Whole families died from execution, starvation, disease and overwork. The Khmer Rouge had its origins in the 1960s, as the armed wing of the Communist Party of Kampuchea – the name the Communists used for Cambodia. Based in remote jungle and mountain areas in the north-east of the country, the group initially made little headway. 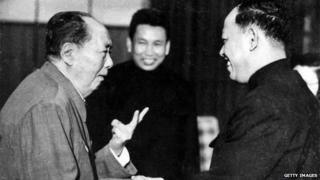 But after a right-wing military coup toppled head of state Prince Norodom Sihanouk in 1970, the Khmer Rouge entered into a political coalition with him and began to attract increasing support. In a civil war that continued for nearly five years, it gradually increased its control in the countryside. Khmer Rouge forces finally took over the capital, Phnom Penh, and therefore the nation as a whole in 1975. During his time in the remote north-east, Pol Pot had been influenced by the surrounding hill tribes, who were self-sufficient in their communal living, had no use for money and were “untainted” by Buddhism. When he came to power, he and his henchmen quickly set about transforming Cambodia – now re-named Kampuchea – into what they hoped would be an agrarian utopia. 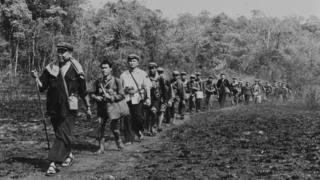 Declaring that the nation would start again at “Year Zero”, Pol Pot isolated his people from the rest of the world and set about emptying the cities, abolishing money, private property and religion, and setting up rural collectives. Anyone thought to be an intellectual of any sort was killed. Often people were condemned for wearing glasses or knowing a foreign language. Ethnic Vietnamese and Cham Muslims in Cambodia were also targeted. Hundreds of thousands of the educated middle-classes were tortured and executed in special centres. 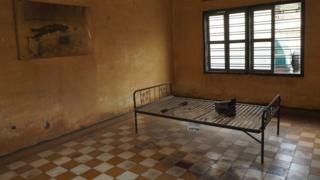 The most notorious of these centres was the S-21 jail in Phnom Penh, Tuol Sleng, where as many as 17,000 men, women and children were imprisoned during the regime’s four years in power. Hundreds of thousands of others died from disease, starvation or exhaustion as members of the Khmer Rouge – often just teenagers themselves – forced people to do back-breaking work. The Khmer Rouge government was finally overthrown in 1979 by invading Vietnamese troops, after a series of violent border confrontations. The higher echelons of the party retreated to remote areas of the country, where they remained active for a while but gradually became less and less powerful. In the years that followed, as Cambodia began the process of reopening to the international community, the full horrors of the regime became apparent. Survivors told their stories to shocked audiences, and in the 1980s the Hollywood movie The Killing Fields brought the plight of the Khmer Rouge victims to worldwide attention. Pol Pot was denounced by his former comrades in a show trial in July 1997, and sentenced to house arrest in his jungle home. But less than a year later he was dead – denying the millions of people who were affected by this brutal regime the chance to bring him to justice. 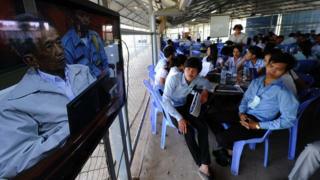 The UN helped establish a tribunal to try surviving Khmer Rouge leaders, beginning work in 2009. Only three Khmer Rouge leaders have ever been sentenced. 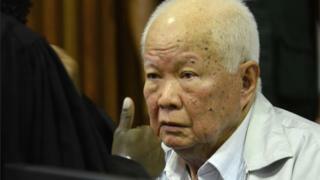 Kaing Guek Eav – known as Duch – was jailed for life in 2012 for running the notorious Tuol Sleng prison. In August 2014, Nuon Chea – considered Brother Number 2 to Pol Pot – and the regime’s head of state Khieu Samphan were jailed for life for crimes against humanity. In November 2018, the tribunal also found them guilty of genocide over the attempted extermination of the Cham and Vietnamese minorities. It remains the first and only genocide conviction against the Khmer Rouge. Previous articleCan Venus Teach Us to Take Climate Change Seriously?